"Thoughts of a backyard farmer"
I have slowed a bit and haven’t kept up with my blog as well as I used to. Things have changed. Not for the worse or for the better, but just because they have. Without the CSA, the fields are quiet, with knee high grass, browned by the sun and bent heavy with seed. There are no more tilled rows or raised beds. The strawberries are gone and so are the raspberries. The fences are rusted and loose from the posts. In places fences are dipped low where the deer jump it, and where the horses reach over to tear at Orchard grass that grows up against it. In more ways than it used to be, it is organic. The field is on its creative own, without my hands and implements to keep it organized. I no longer tell it what to grow. The CSA ran its course. Maybe someday I will start a small version again. Going fallow had nothing to do with losing interest, but losing time. There just was not enough of it for me, Kath, or the persons who loyally volunteered. Our situations changed. And too, the market changed – farmer’s markets came to every town, aisles of “organic” food appeared in grocery stores, home delivery started, and people began to grow their own gardens and raise backyard chickens. A drive to the CSA seemed a wasted afternoon when other choices became easy. It seemed that farmers who once asked for support on the farm went into the towns and stores with tables and cellophane packaging, and became all they set out not to be. Once again, no one had to wash the dirt from their fingernails to feel good about their food. In a sense, we came full circle, but with more awareness of the difficulties. That’s ok. I am not complaining. I have moved on. I can enjoy that many of my former customers now grow their own food, have chickens, and some have gone on to have their own small farms. I feel that all those who once worked this ground spread the right kind of change. I’d like to think that during those few years when we were a CSA we all made a difference. Now I mostly grow for myself and a few persons who ask for things. I still use my “hot house” for greens and vegetables, and this winter I am experimenting to see if garlic can be done under cover. I keep enough chickens to supply a few “customers”. I keep two bee hives – not to save the earth, but because I like bees. I am smaller, and I find I am even more “green” now. I’m actually better. 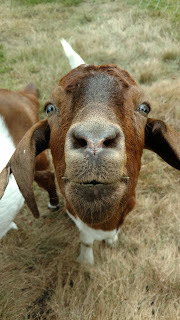 And without the CSA, I spend more of my “spare” time with the horses, goats, chickens, and the nature here. I’ve had time to put together a book of poetry and continue learning photography. I have time to explore music and books. Where does all this leave the blog? We are still a farm, but not the same farm. And maybe that’s how I need to think of the blog- still my blog, but not the same blog. It too, needs to change. Not necessarily for the better, or for the worse, but because change is long over due. With it, I hope to explore more and new things! Good memories bring good tomorrows. I hope you’ll follow me when you can, stop in and say hi. Maybe visit for a while. That I hope will not change. Last week we lost Mary. Although we are not sure exactly what happened, it seems that it was a “freak” accident while playing with the other girls. Goats can be rough with each other without meaning to (and with meaning to). Goats also seem to get themselves into situations that need rescue. A while back a goat breeder said that “goats are always trying to find a way to die”. I’ve told most everyone who asks about our goats that out of all our animals – the others being horses, chickens, and ducks – that goats are the hardest to care for. Lice, worms, copper deficiencies, lack of minerals, poisonous plants, over eating, etc, and then their lack of common sense and being straight line thinkers – straight line meaning that they cannot reason to go around something, but only go straight into it or through it - make them challenging to care for. They can come down with diseases and infections easily, and are subject to many physical problems. Goats are not these tough tin can eating machines. They are feathers in the wind. Yet, goats are easy to love, especially the ones who have been handled as kids. I compare goats to dogs when it comes to relationships. They aren’t much different, giving unconditional devotion and companionship. Playful, loyal, and always best of friends, goats as pets will follow a trusted owner everywhere and anywhere. And that is what makes it so much harder when one passes. They aren’t just goats. Mary was the “runt” of our herd. We believe that as a kid she had coccidia – a parasite that damages the intestines so that nutrients from food cannot be absorbed. Goats that survive coccidia never fully recover and are usually underweight and stunted. Mary never “took off”. And because she was smaller than Irene and Frances, she was easily bullied and lowest of the pecking order. At food time, she was easily pushed aside and was lucky to get any grain. We solved this by feeding her separately, pulling her from the pen and giving her a pan of grain that she didn’t have to compete for. Later, when Ellen joined the herd, we would feed both of them in this manner. Mary did begin to fill out and became healthier, but as an adult, she stayed small, and weighed a third less than her “big sisters”. She would always be third in the pecking order, but at least she now had a chance. The separate feeding created a different type bond than we had with the others. She came to us as her protectors, and we always made sure she got little extras to make up for her place in the heard – bit of extra food, that second treat, walks alone with us so she could browse undisturbed, etc. When Ellen came along, Mary remained third, and Ellen became a very close fourth. Both being small, they stayed together most of the time. We made a separate shed for them, and fed them outside the pen together. The herd of four had more balance and it seemed the hierarchy was defined and stable, and everyone was content. I will miss Mary. I will always remember how she would fall back from the herd and side up to me for a treat or a little extra grain. Her smile – yes she had a smile, or grin, that showed off her small overbite – a bucktoothed smile. And her bounce when she walked – her feet were like little springs that gave her a dancing walk and run. The floppy ears, her right one torn from an accident when she was maybe a year old, that made me think of her as the “flying nun”. Her trusting, curious eyes. Like all animals, she had her own way about her that can’t be replicated or replaced. I can’t say that I was ever into politics. I have always felt it is a landscape of “dis” - dissection and distrust working to dissolve our unity. And I’ve pretty much had it. Politics survives on blinded masses and lemming thinking, no matter what view a person takes. We are all headed to the cliff. Individuality is stripped away and anger is refinished. This year is no exception. I hear of walls and hate and accusations but hear nothing of what we have in common to build upon. We stand back to back, with word ready pistols. Politics isn’t about coming together. It’s about drawing from the hip. I am not voting this year – either locally or nationally. Voting has become nothing more than expressing a grudge. By not voting I am not wasting my vote. I am expressing my opinion that I am tired of it all. Sometimes I think what if no one would vote and no one would be elected. We’d then have no one to blame for our dislikes. There would be no scapegoat. We’d have no excuses. We would be forced to carry our country by ourselves and it would take all of us working together. Unfortunately, this country has fallen on excuses, finger pointing, and hate, rather than shared responsibility. The melting pot has separated at the boil. My recently released indie book, The Sky, the Stable, and Spaces in Between, is a collection of my poetry, haiku, and photography. "In this collection, the author/ photographer combines the creative imagery of haiku with photography to celebrate the beauty of the sky, explore the relationships between himself, horses, and other animals, while using poetry as a means to question the value of a materially complex and hurried life." Seventeen Farms is home for my family, along with our horses, goats, ducks, chickens, cats, and honey bees. Seventeen Farms is also a home to various wildlife - deer, wild turkeys, and more. We do our best to live in harmony with nature, and with all who come here, including our friends. I created this blog to write about my experiences here and my observations of life in general.